Mail Chimp, Constant Contact and Create Sendare basic email platforms that do not include the features that are included with RestauranteMarketing at not extra cost. If you are using Mail Chimp Pro, Constant Contact Plus or Create Send we will save you 15% each month & guarantee your pricing for a year. We know that automated emails get 119% higher click rates than broadcast emails. That’s because they speak directly to your customers at just the right time. With Restaurant eMarketing we DO NOT charge extra for Automation and Trigger Based Emails, unlike MailChimp and Constant Contact. Build unlimited Segments based on subscriber data like demographics, spending history, tenure, store...and more! See performance metrics for individual emails or an entire series. A simple dashboard interface that allows you to easily manage your members. View which emails a Member clicked, opened, received, clicked, and forwarded. Quickly see what Members are in each Group or List and when they joined. Gather additional data about your Members and segment the database. Update their information or change their subscription status... it couldn't be easier! Quickly see Members who have recently joined or updated their profile. Create traditional opt-in forms and embed them on your website or within Facebook. Upload your Online Ordering or Loyalty Club Members in seconds! Supercharge your database's growth with a Lightbox on your website!!! We support .CSV, .XLS, and .XLSX formats for importing new Members to your Club. Add one member or multiple members through your Account Dashboard. Quickly see how many "new" and "existing" Members were in your list(s). Send campaigns to segmented members...at no additional cost/charge! Target specific members based on their data or previous campaign history. Manage and Create an unlimited number of Demographic Fields for your Members. Quickly view all of the campaigns that you and your team are working on. Edit or Copy previous campaigns and resend them in minutes to your members. View upcoming scheduled campaigns in one easy to use dashboard. View triggered based emails that are currently configured for your account. View when the campaign will be sent and to which groups/segments of your list. Use your own HTML, one of our templates, or a custom designed theme. UNLIMITED image storage for your account...unlike other providers. UNLIMITED document storage for your account... unlike other providers. 1000s OF TEMPLATES FOR YOU TO USE... FOR FREE! Whether it's a Birthday Email, New Location Opening, Upcoming Event/Promotion, or New Menu Launch... we have a layout that will work for your restaurant. Stop paying other companies or vendors to design templates or stationery... or paying extra to use them! Using our "Drag and Drop" Editor makes building your campaigns as easy as a move of your "mouse." Just "drag" and the "drop" the content block...whether it is an image, a button, a video, or a survey... and then chose the creative file. It's never been easier! Send a "test" of each campaign to yourself and your team to test before sending. Select your group/segment, subject line and when to send... it takes seconds! Test various Subject Lines... and have the winning one sent automatically! Stop paying "extra" with other email marketing providers like MailChimp and Constant Contact or Automation/Triggered Emails. With Restaurant eMarketing you never have to pay "extra" for email marketing features...even as we introduce new enhancements! View all your Automated and Triggered campaigns in your dashboard. 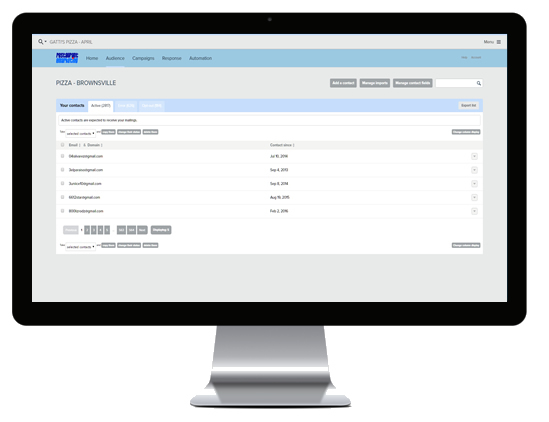 Quickly see the results of a specific Automated / Triggered campaign. Select who... Select what... Select when... it really is that easy to Automate! Name your Automated campaign for quick reference and future editing. Send the campaign based on a variety of Member activity or actions. Only send an Automated campaign to specific Groups of your database. Quickly select which campaign will be sent as part of the Automation. ... or send the Automated campaign to only a certain Segment of your database. Determine when the campaign is sent... immediately or in the future! Quickly see the overall performance of your Account... Compare Previous Campaigns... and Export the Reports! Get a quick snapshot of each campaign's response, including open rate, click thru rate, deliverability, shares, and opt-outs. Quickly see what links and areas of your campaign got the most customer engagement so you can improve future campaigns. View each Member that opened your campaign and save it as a segment. View New Members that enrolled into your database as a result of a campaign. View each Member that clicked on a specific link in your campaign. See who unsubscribed from your database from each campaign. Track the virility of your campaign with sharing on various Social Networks.. Export the results of each campaign into an Excel Spreadsheet for review. Every campaign has a unique URL that can be shared on your website or on any Social Network to inform your Fans and Friends about upcoming events. You can even save it as a PDF. Export a quick snapshot of a campaign's results into a one page PDF and share the results with your Team Members.